The 2017 Fall Simulator League will begin on Monday, October 30th. The Fall League runs for 6 weeks. Each 2-person team will have from Monday at 8:00 AM to Sunday at 9:30 PM to get their round in for each week. If a team has a conflict in any week, the team can play one week ahead. The Fall League cost $50 per player for the league fee. This money goes into the prize fund. Each weekly league round costs $30 per player if played Monday-Friday or after 1:00 PM on the weekend. Any rounds played before 1:00 on weekends will cost the regular rate of $35 per player. The 2018 Winter Simulator League will begin on Monday, January 6th. The Winter League runs for 8 weeks. Each 2-person team will have from Monday at 8:00 AM to Sunday at 9:30 PM to get their round in for each week. If a team has a conflict in any week, the team can play one week ahead. The Winter League cost $60 per player for the league fee. This money goes into the prize fund. Each weekly league round costs $30 per player if played Monday-Friday or after 1:00 PM on the weekend. Any rounds played before 1:00 on weekends will cost the regular rate of $35 per player. 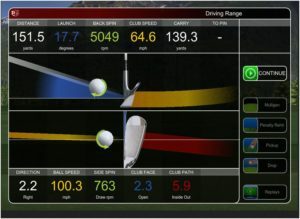 Gray Eagle has 3 HD Golf Simulators. 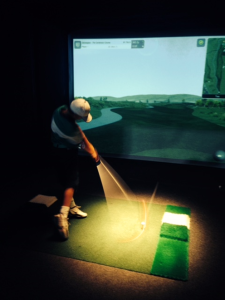 The simulators can be used to play or practice. Fees for Simulators: $35.00 per hour It generally takes 1 hour per player for 18 holes of simulated golf. Call in advance to book a Tee Time. The first Simulator Tee Time is at 8:00 AM. If you have any questions about booking times on the simulator please send us an email at info@grayeaglegolf.com or call at 317-845-2900. Also we reserve the Simulators for company parties, bachelor parties, and group events.